Essex police officers have been educating students in Inglestone about the dangers of driving while under the influence of alcohol and drugs. Police Community Support Officer Matt Grimwood, from the Brentwood Neighbourhood Policing Team, visited the Anglo European School where he spoke to more than 240 students about the risks associated with drugs and alcohol. He spelt out the dangers of driving while under the influence and the increased risk of collisions due to peer pressure and impaired judgement. Students were also shown interactive videos to help educate them on the drink and drug driving law and given the chance to discuss any issues or concerns they had about substance misuse. 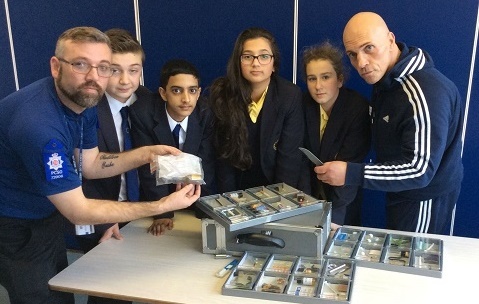 This workshop was one in a series organised by Essex Police aimed at raising awareness about substance abuse, in a bid to highlight that taking drugs at a young age can lead to a downward spiral of drug use and crime. Essex Police are also supporting SERP’s festive drink and drug drive campaign which runs from 30 November to 4 January 2016. As part of the campaign, Essex Police are also encouraging people to report anyone they know who regularly drinks or takes drugs and drives, via the Crimestoppers number 0800 555 111.